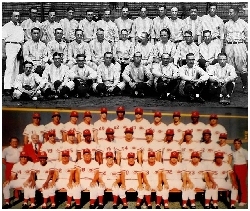 1976 REDS VERSUS 1927 YANKEES « THE BRYCE IS RIGHT! – Which was the best team in Major League Baseball? One of the favorite arguments among baseball aficionados is, “What Major League team is considered the greatest of all time?” Inevitably, the 1976 Cincinnati Reds is matched against the 1927 New York Yankees, two great teams from different eras. First, I would like to make my case for the Reds as I was fortunate to have watched them during the 1970’s. I also have a fondness for the Yankees, particularly this legendary group from the 1920’s who dominated the baseball world in their heyday. Won two back-to-back World Series titles (1975-1976). Was in the World Series four times during this period. The team’s combined record from 1970-1976 was 683 wins and 443 losses, an average of nearly 98 wins per season. In 1976, their record was 102-60, a record for the time. During the 1976 All-Star Game, the Reds dominated by having five players in the starting line-up, Bench, Rose, Morgan, Foster, and Concepción. Also in 1976, they swept the New York Yankees in the World Series 4-0, with an accumulated score of 22-8. The team was best known for its speedy offense and “Gold Glove” defense. 1970 and 1972 NL MVP (same years the Reds went to the World Series). All-Time Rawlings Gold Glove Team. NL Rookie of the Year (1968). In 1976, 16 HR, 74 RBI. Reds retired his number, 13. 9 time All Star; MVP (1982). 5 time Gold Glove winner. In 1976, .281 average, 21 stolen bases. 5 time All Star; MVP (1976). 2 time NL home run champ (1977, 1978). 3 time NL RBI champ (1976-1978). In 1976, .306 average, 172 hits, 29 HR, 121 RBI. In 1976, .307 average, 22 stolen bases. In 1976, .336 average, 189 hits, 34 stolen bases. Hall of Fame. Reds retired his number, 8. 1975 and 1976 NL MVP (same years the Reds won the World Series). 10 time All Star; MVP (1972). In 1976, .320 average, 151 hits, 60 stolen bases. Hall of Fame. Reds retired his number, 24. 7 time All-Star; MVP 1967. In 1976, 19 HR, 91 RBI. 17 time All Star. Won 1970 All-Star Game. 3 time batting champion (Silver Bat Awards). Career Hits: 4,256 (MLB Hits King). NL hitting streak record (44). NL Rookie of the Year (1963). Most seasons of 200 or more hits – 10 (shared). And many other MLB records. In 1976, .323 average, 215 hits. Cincinnati Reds Hall of Fame. Hall of Fame. His #10 was retired in Cincinnati. 3 times World Series champion; twice with the Reds and once with the Detroit Tigers. He was the first manager to win championships in both the National and American Leagues. American League Manager of the Year in 1984 and 1987. The unsung hero of the Reds was their General Manager, Bob Howsam, who helped engineer the team. As GM, he built up the club’s farm system, producing players such as Concepcion and Griffey. In 1971, he crafted a deal with the Houston Astros which brought Morgan, Foster and Geronimo to the Reds. He was also the man who replaced veteran manager Dave Bristol with an unknown, Sparky Anderson. Won two back-to-back World Series titles (1927-1928). Was in the World Series three years in a row.In 1927, their record was 110–44, a record for the time.Also in 1927, they swept the Pittsburgh Pirates in the World Series 4-0, with an accumulated score of 23-10. The team was best known for its awesome batting. Capable catcher but was traded after the 1927 season. Hall of Fame by Veterans Committee. In 1927, .356 average, 231 hits. Finished his career with a .957 fielding percentage as a third baseman. Hall of Fame. First player to have his uniform number retired in MLB, 4. 1927 AL MVP, same year as winning the World Series, and 1936. Gehrig played 2,130 consecutive games, a record that lasted several years until Cal Ripkin, Jr. or the Orioles broke it in 1995. In 1927, .373 average, 47 HR, 175 RBI. Batting a team-leading .500 in the 1927 World Series. In 1926, .285 average, 150 hits, led the AL in errors (47). Hall of Fame (posthumously by Veterans Committee). Considered one of the top hitting second basemen of his era. In 1927, .309 average, 102 RBI. AL Home run champion (1925). In 1927, .337, 174 hits. Hall of Fame. Yankees retired his number, 3. Played on 7 World Series Champion Teams. Named the greatest baseball player of all time in various surveys and rankings. In 1927, .356 average, 60 HR. In 1927, 22 game winner, most in AL. 3 times World Series champion with the Yankees. * Two were awarded by the MLB Veterans Committee. ** Gold Glove started in 1957, after the 1927 Yankees. From the statistics, the Yankees had a definite edge in terms of batting, which explains how they received the nickname “Murderers’ Row.” Pitchers were simply intimidated by them. Both Ruth and Gehrig had superlative seasons in 1927, particularly in terms of slugging. In addition, five players of the starting rotation batted over .300. The Reds also had five players of the starting rotation batting over .300, but they also had speed, defense and balanced pitching. Whereas the talent of the Yankees was primarily vested in Ruth, Gehrig, Combs, and Lazzeri, the Reds represent a more complete team of talent. In reality, this is not about which team is better, but instead, it denotes the attributes of a great team. Both the Reds and the Yankees had truly great players, great coaching, discipline on the field, but also knew how to have fun. Any differences or opposing attitudes were put aside for the sake of the team. The key though was their ability to play as a cohesive unit, where each player watched the back of the other. This is also a fine example of leadership, where the great players inspired the others to play at a higher level. As role models, they set an example for others to emulate. For example, the friendly competition between sluggers Ruth and Gehrig, resulted in Ruth hitting his record 60 home runs in 1927, and Gehrig gathering 175 RBI. This helped push others like Combs to collect 231 hits, and Muesel and Lazzeri to collect over 100 RBI each. On the Reds side, players like Bench, Rose, Morgan and Perez led the team. On the field, Bench was the field general who controlled the game. From his vantage point behind home plate, he could see everything and instructed the defense accordingly. Rose and Morgan were the spark plugs who charged the machine into action, and Perez was a mentor to the younger players. It was much more than just talented players, both teams were examples of leadership determined to achieve greatness. Regardless whether you prefer the Reds or Yankees, we will probably never see the likes of such teams again in our lifetime. Keep the Faith!Note: All trademarks both marked and unmarked belong to their respective companies. Tim Bryce is a writer and the Managing Director of M&JB Investment Company (M&JB) of Palm Harbor, Florida and has over 30 years of experience in the management consulting field. NEXT UP: THE USDA’S SYSTEM SNAFU – Another example of government waste and incompetence in building systems. LAST TIME: BACKING UP THE TRUCK – Whoa, slow down! Let’s not leap before we look.